Washington State's new law makes it legal for adults to possess up to one ounce of marijuana, but some speculate the federal government will prosecute those who use marijuana on federal land because federal law prohibits marijuana use. NBC's Kristen Dahlgren reports. The grass is no greener. But, finally, it's legal — at least somewhere in America. It's been a long, strange trip for marijuana. Washington state and Colorado voted to legalize and regulate its recreational use last month. But before that, the plant, renowned since ancient times for its strong fibers, medical use and mind-altering properties, was a staple crop of the colonies, an "assassin of youth," a counterculture emblem and a widely accepted — if often abused — medicine. On the occasion of Thursday's "Legalization Day," when Washington's new law takes effect, here's a look back at the cultural and legal status of the "evil weed" in American history. George Washington and Thomas Jefferson both grew hemp and puzzled over the best ways to process it for clothing and rope. Indeed, cannabis has been grown in America since soon after the British arrived. In 1619 the Crown ordered the colonists at Jamestown to grow hemp to satisfy England's incessant demand for maritime ropes, Wayne State University professor Ernest Abel wrote in "Marihuana: The First Twelve Thousand Years." After the Civil War, with hospitals often overprescribing opiates for pain, many soldiers returned home hooked on harder drugs. 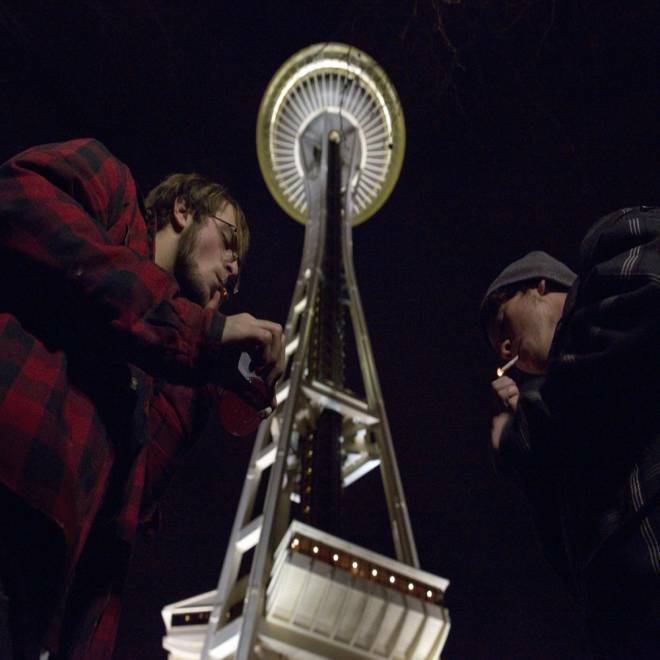 Dustin, left and Paul, both from Pyuallup and neither of whom would give a last name, smoke marijuana beneath the Space Needle shortly after midnight on Dec. 6. Those addictions eventually became a public health concern. In 1906, Congress passed the Pure Food and Drug Act, requiring labeling of ingredients, and states began regulating opiates and other medicines — including cannabis. By the turn of the 20th century, cannabis smoking remained little known in the United States — but that was changing, thanks largely to The Associated Press, says Isaac Campos, a Latin American history professor at the University of Cincinnati. In the 1890s, the first English-language newspaper opened in Mexico and, through the wire service, tales of marijuana-induced violence that were common in Mexican papers began to appear north of the border — helping to shape public perceptions that would later form the basis of pot prohibition, Campos says. The hysteria was captured in the propaganda films of the time — most famously, "Reefer Madness," which depicted young adults descending into violence and insanity after smoking marijuana. The movie found little audience upon its release in 1936 but was rediscovered by pot fans in the 1970s. Congress banned marijuana with the Marihuana Tax Act of 1937. Anslinger continued his campaign into the '40s and '50s, sometimes trying — without luck — to get jazz musicians to inform on each other. "Zoot suited hep cats, with their jive lingo and passion for swift, hot music, provide a fertile field for growth of the marijuana habit, narcotics agents have found here," began a 1943 Washington Post story about increasing pot use in the nation's capital. Congress responded to increasing drug use — especially heroin — with stiffer penalties in the '50s. Anslinger began to hype what we now call the "gateway drug" theory: that marijuana had to be controlled because it would eventually lead its users to heroin. In 1972, Bonnie was the associate director of a commission appointed by President Richard Nixon to study marijuana. The commission said marijuana should be decriminalized and regulated. Nixon rejected that, but a dozen states in the '70s went on to eliminate jail time as a punishment for pot arrests. When she became first lady, Nancy Reagan quickly promoted the anti-drug cause. During a visit with schoolchildren in Oakland, Calif., as Reagan later recalled, "A little girl raised her hand and said, 'Mrs. Reagan, what do you do if somebody offers you drugs?' And I said, 'Well, you just say no.' And there it was born." In recent years, medical marijuana dispensaries — readily identifiable by the green crosses on their storefronts — have proliferated in many states, including Washington, Colorado and California. That's prompted a backlash from some who suggest they are fronts for illicit drug dealing and that most of the people they serve aren't really sick. The Justice Department has shut down some it deems the worst offenders. On Nov. 6, Washington and Colorado pleased aging hippies everywhere — and shocked straights of all ages — by voting to become the first states to legalize the fun use of marijuana. Voters handily approved measures to decriminalize the possession of up to an ounce by adults over 21. Colorado's measure also permits home-growing of up to six plants. Both states are working to set up a regulatory scheme with licensed growers, processors and retail stores. Eventually, activists say, grown-ups will be able to walk into a store, buy some marijuana, and walk out with ganja in hand — but not before paying the taxman. The states expect to raise hundreds of millions of dollars for schools and other government functions. But it's not so simple. The regulatory schemes conflict with the federal government's longstanding pot prohibition, according to many legal scholars. The Justice Department could sue to block those schemes from taking effect — but hasn't said whether it will do so. AP researcher Julie Reed Bell contributed to this report from Charlotte, N.C.